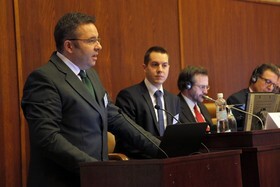 The Central European Service for Cross-border Initiatives Balkans (CESCI Balkans) in cooperation with the Centre for Balkan of the Association of European Border Regions (AEBR Balkans) organized a Seminar on Spatial Planning and Cross-Border Cooperation for Local Authorities on 7th of December 2015 in Novi Sad, Serbia. The seminar was supported by the Ministry of Construction, Transport and Infrastructure of the Republic of Serbia and the Government of the Autonomous Province of Vojvodina. At the opening of the Seminar welcoming speeches were given by Dr. Slobodan Puzović, Provincial Secretary for Urban Planning, Construction and Environmental Protection, MSc Đorđe Milić, Assistant Minister, Ministry of Construction, Transport and Infrastructure, Elisabetta Sartorel, Project Manager, Cross-Border Cooperation Programme, EU Delegation to Serbia, and Ervin Erős, Director of the Central European Service for Cross-Border Initiatives Balkans (CESCI Balkans). Lecturers at the seminar were Gyula Ocskay, Secretary General of CESCI, Martín Guillermo Ramírez, Secretary General of AEBR, Ervin Erős, Director of CESCI Balkans, Ana Nikolov, AEBR coordinator for Balkans, Dr Siniša Trkulja, Adviser in the Ministry of Construction, Transport and Infrastructure of the Government of the Republic of Serbia, Dragana Dunčić, Assistant Director, Urban and Spatial Planning Institute of Vojvodina and Dr. Tamara Zelenović Vasiljević, Independent Expert Associate, Urban and Spatial Planning Institute of Vojvodina. 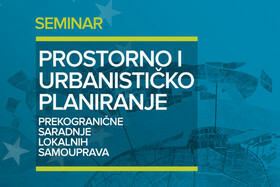 More than 120 participants attended the Seminar, mainly representatives of local governments from Serbia, Montenegro and Bosnia & Herzegovina: mayors and deputy mayors, chiefs and employees at urban and spatial planning departments of the municipalities and directors, employees of the Directorate for planning and constructions within the municipalities. Such a large number of participants and their active participation at the seminar indicates that spatial planning of cross-border cooperation is a relevant and important topic for the Balkan Region. 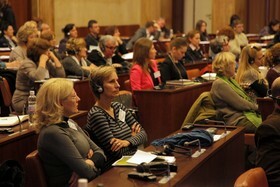 To carry out specialised seminars for local governments.